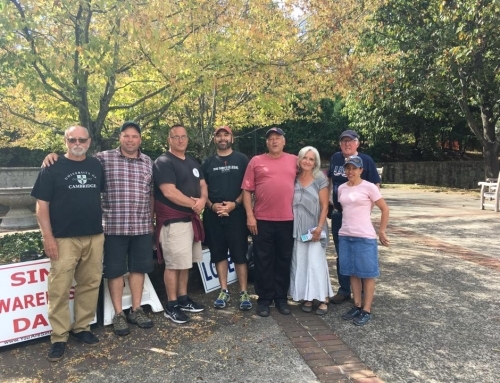 BLACKSBURG, VA – Next to Marshall University, Virginia Tech was the other question mark on the schedule. 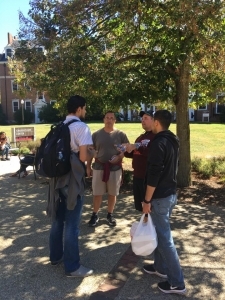 After talking with other evangelists, most had never been on campus, but preached just outside of it on a street corner near the entrance by restaurants. Additionally, I had a back and forth exchange with the VT Events Coordinator. He insisted we needed to pay a fee and be sponsored by a college organization. I switched gears and decided to try another route. If our team simply showed up and began preaching, eventually someone would complain. And that complaint would be directed to security. So I called the head of security and explained that when we show up, he would probably get a call. At that point, I asked what his response would be. We exchanged a couple conversations and decided to play it by ear. We arrived and setup in the middle of the main area across from the Student Center where they eat and visit services offices. 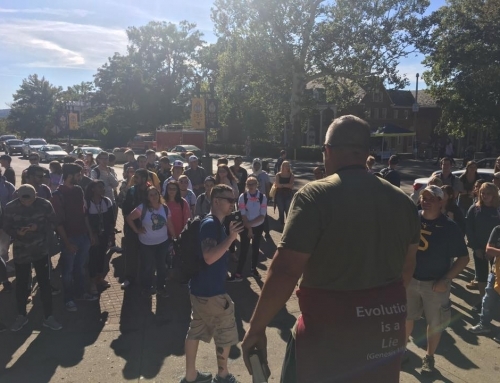 As the preaching began, many students were empathetic and meandered on by with the occasional heckle. Initially most interaction came from a young lady named Emma who represented Chi Alpha (a college ministry of the Assemblies of God). We had a pleasant conversation and all seemed well. But after about an hour of the Gospel being proclaimed they packed up their tent and headed out. Perhaps my favorite moment on the tour involved brother Jimmy Hamilton (visit his website) who lives and works out of North Staffordshire in the UK. 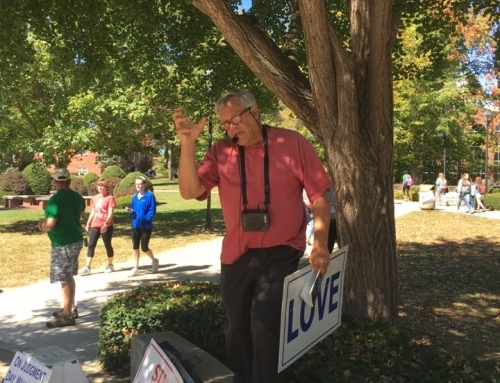 After several years of pastoral ministry, he traded the comforts of the pulpit for the challenges of the streets and open-air preaching. 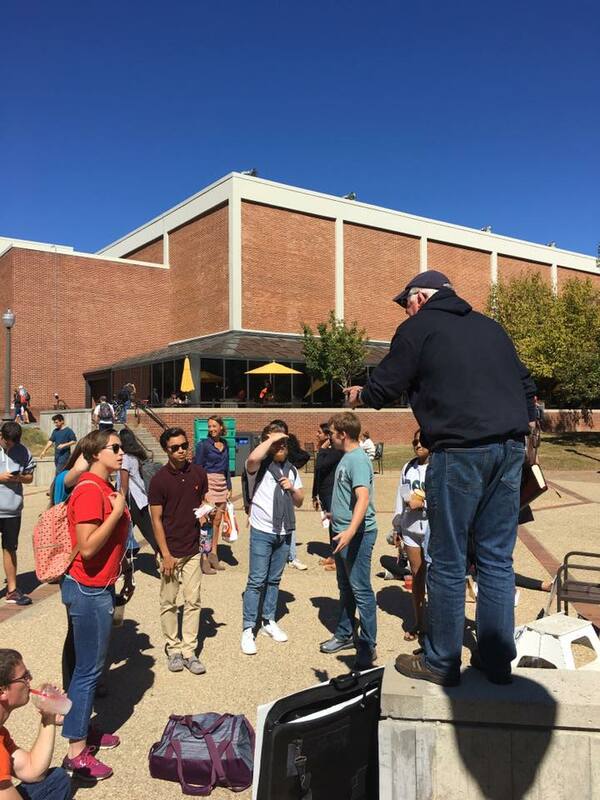 As he began to preach, students were drawn in by his accent and kept by the message of the Gospel he was proclaiming. At one point, some students actually sat down and were raising their hands asking questions! What I witnessed next was the Holy Spirit coming upon him as he transitioned back into a pastoral manner to teach, and boy was school ever in session. The students took turns asking questions which eventually turned into accusations of intolerance. It was when a Muslim student challenged brother Jimmy that allowed us to see God at work (see video here). Jimmy made quick work of dismantling the religion of Islam with grace. The Muslim young man acknowledge Moses as a prophet. Yet when Jimmy quoted Moses stating there must be a blood sacrifice for the remission of sin, and asked where in Islam is the blood sacrifice, the Muslim had no answer. Just before 2pm, my phone rang with a Blacksburg, VA phone number on the screen. Sure enough it was the Sergeant that I had previously spoken with earlier in the week. He asked how it was going and we had a cordial conversation. He then asked how long we had been there. When I told him, his joyful response was, “Well that’s fantastic. You guys have been there for almost 3 hours and I just go my first whining complaint!” He mentioned should anyone say anything, direct them to him as he would take care of it. God’s favor was on our efforts for sure. 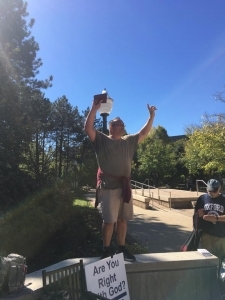 I eventually made my way to the box (actually a small wall) to preach a little after 3pm and was interrupted about 20 minutes into my preaching. Two police officers who were floating around the perimeter talking with other members of the team politely walked up and interrupted me asking for a permit. When I mentioned that I has already spoken to their supervisor, they agreed to call to confirm. They walked off never to return. It’s routine to hear unbelievers try and discount the Gospel message by twisting Old Testament laws out of context and misapplying them. Usually, OT slavery, mixed fabrics, trimming beards, and shellfish are the typical run-of-the-mill objections. After explaining the difference between ceremonial/priestly, civil, and moral law and that only God’s moral law is still intact today, most either scoff and walk off or continue even more belligerently. I experienced the latter. 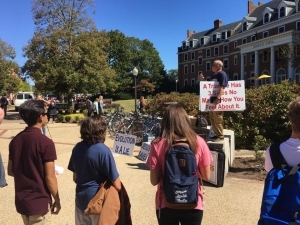 While I was preaching an older man wandered by and attempted to distract the preaching by claiming I wasn’t a true believer if I didn’t own any slaves, citing Leviticus 25 for his position. I spent a couple minutes obliging him, but realized he was just a distraction and I returned to preaching. As I was about to finish, an interesting back and forth began with a young lady sitting across from me. I asked Andy to continue preaching so I could go and talk with her rather than shouting across the way. At one point when I was preaching, her trump card was, “So then if you believe the Bible you believe I should be stoned to death because I haven’t always honored my parents? !” To which I replied, “No! Not at all. That’s why Jesus had to come, to take that punishment so you wouldn’t have to!” She was speechless. Our conversation, though, quickly switched to the real underlying issue she had. She was a bisexual. I reasoned with her for about 20 minutes before she left back to class. Though she wasn’t convinced, she seemed to have left with her defenses down and a consideration for what we talked about. Pray for her. Many times, it is hard to keep your flesh in submission, especially when the exchanges get heated. And sometimes, for the sake of the Gospel message when you are ministering, the enemy will send a distraction. And sometimes you need to deal with those distractions directly and disengage with the person. The man who interrupted me while preaching, inserted is slavery theory again while I was trying to minister to the young lady who was a bisexual. But this time, he insisted he was doing it to help me be a better preacher! I reluctantly acknowledged him and after he made a remark about truth I simply asked, “Sir, do you believe in absolute truth?” To which he responded,”No.” Not seeing the absurdity in his position that it was absolutely true there was no absolute truth, I politely told him to come back when he reconciled that logical fallacy and returned to ministering to the young lady. Overall, the day was fantastic and yet again God was faithful. Mike had an extended conversation with some Muslims, Andy ministered to a belligerent, professing atheist, and the rest of us continued in one-on-one conversations. We were able to finish without incident. But the second best moment of the tour was yet to happen…. Earlier in the day when Jimmy was preaching, a young lady was particularly rude to him. Her speech was seasoned with profanities and she was extremely hateful. As we were packing up, she reappeared and with tears in her eyes apologized to Jimmy for being rude. What a moment to see that exchange. A young lady who just a few hours before was filled with hatred for a herald of the Gospel, now repentant and embarrassed of her actions. God is good.